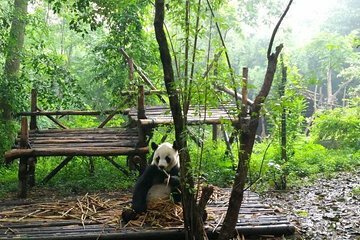 Spend the day visiting two of the Chengdu area’s top locations on this full-day private tour. First, head to the Giant Panda breeding center for a closer look at these gentle giants. See them playing, take photos, and learn more about the conservation efforts from China. Then, head to the UNESCO-listed Leshan Giant Buddha to admire the tranquility of the area and enjoy a delicious lunch at a local restaurant. Thank you to Bella for the most wonderful day. This tour was amazing but Bella was the best tour guide ever. We would definitely recommend this tour. Thank you Bella! Excellent trip led by Nancy. Very informative tour. Next time I would choose to hike up the Giant Buddha rather than viewing it from the boat.